Godsmack's Sully Erna said, "We're honored to be headlining the Louder Than Life festival in Louisville this year! Looking forward to partying with all of you again real soon!" 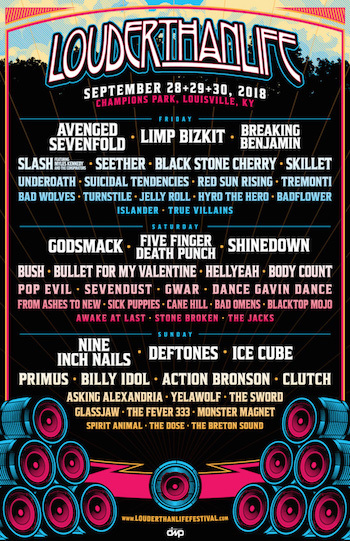 Benjamin Burnley of Breaking Benjamin commented, "We're excited to come back to Louisville for Louder Than Life 2018 and play songs from our new album EMBER for the first time in Kentucky! We always have a good time there and look forward to what we know will be a kickass show." Attendees 21+ up can choose to visit Bourbon World presented by the Louisville Courier Journal, and enjoy crafted cocktails at the exclusive Down The Rabbit Hole Speakeasy; sip fine wine at the Caduceus Wine Garden; or enjoy a local brew at the Craft Beer Bar. Other spirits can be enjoyed at the Heavy Tiki Bar presented by Jim Beam, or at the Jack Daniel's Experience for a "taste of Tennessee." If patrons are looking for an elevated culinary experience, they are invited to take a tour of the newly added culinary food parties where guests can enjoy signature cocktails paired with gourmet plates. The "Lock and Key Pizza Parlor" will be presented by Larceny with signature selections from Spicy Pie Pizza. The "Southern Soul BBQ" presented by Maker's Mark will feature smoked delicacies from Boss Hog BBQ. The "Sip & Grill" presented by Southern Comfort will feature renowned Louisville chef Edward Lee of Whiskey Dry. Chef Lee will be offering a selection of his gourmet Whiskey Dry burgers paired with refreshing Southern Comfort cocktails.